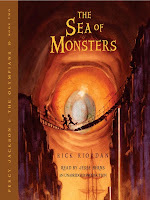 Percy soon discovers there is trouble at Camp Half-Blood: the magical borders that protect Half-Blood Hill have been poisoned by a mysterious enemy, and the only safe haven for demigods is on the verge of being overrun by mythological monsters. To save the camp, Percy needs the help of his best friend, Grover, who has been taken prisoner on an island somewhere in the Sea of Monsters, the dangerous waters Greek heroes have sailed for millennia. Only today, the Sea of Monsters goes by a new name: The Bermuda Triangle. Together with his friends, Percy must retrieve the Golden Fleece from the Island of the Cyclopes or Camp Half-Blood will be destroyed. But first, Percy will learn a stunning new secret about his family, one that makes him question whether being claimed as Poseidon's son is an honor or simply a cruel joke. Sea of Monsters. What can I say? This book reminded me so very much of The Iliad and the Odyssey that it's not even funny. But actually it was funny. It was hilarious. I mean, I enjoyed the Iliad and the Odyssey, but I didn't laugh. Someone needs to tell Homer that this new version of his story is better cause it's funny. Anyone who's read Percy Jackson and the Lighting Thief should just go ahead and continue the series. It's great -- Just keeps getting better with each book. So I can't really tell you much about this book without going all "spoiler alert" on you. But I recommend it highly. I've also heard there's a movie coming out? Which I don't really see how that's possible since they screwed up the first movie plot so much they can't really introduce the second without completely re-writing it. Enough rant. I gave this book 4/5 on goodreads.com.